A population pyramid shows the distribution of various age groups in a population, for men and women. It's a great way to communicate the age distribution; to see, e.g., that a country has a very young or very old population. It's a common chart type, so most readers won't have problems reading this chart type. In this tutorial, we will create a population pyramid with Datawrapper's split bar chart. One header row containing labels ("Age span", "Male" and "Female"). The first column defines the age buckets ("15-20", "20-25", etc.). Alternatively, years or single ages work. The second and third column contains the number of people in this age bucket, for males and females. This number can be absolute, like in our cases, or relative (shares of the population). Here, your data should look like above. If your first column contains dates (like years, days, weeks), Datawrapper will tell you that it detected the data format and will color it green. Numbers will appear in blue. To learn more about data column type detection, visit this article. First, you want to make sure that the number format works best for this chart. You can find the number formatting in the panel "Labeling". If you have very high population values, choose the number format "123.45k" or "123.4k". In case your pyramid shows population shares, choose the format "0%" or "0.0%". You can also play around with the space between the columns. Maybe you prefer no space between the male and the female numbers at all? We also turned on the bar background, to give the whole chart a less cluttered appearance. In the last two tabs, you can add annotations and choose the design for your chart. 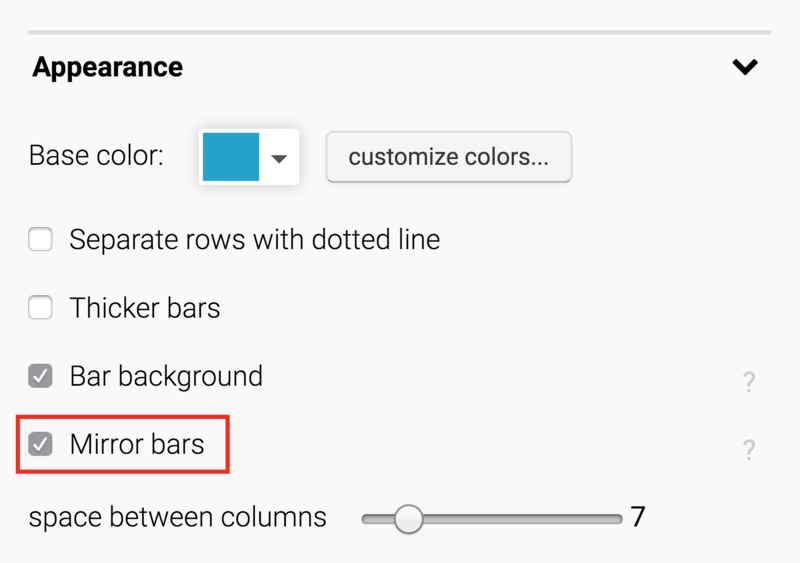 Visit the article "Customizing your split bar chart" to learn more about these features. Click on "Publish" to get to the last step, "Publish & Embed". Congratulations to your finished population pyramid! In this last step, you can publish your work and decide how to share it with the world. The best way to use a Datawrapper chart is by embedding it directly on your website. To do that, click the big blue button that says " Publish Chart". Then, copy & paste the embed code snippet into your website or CMS. You can also download your chart as a PNG or PDF by upgrading to a paid Single or Team account.